So you’ve chosen Valentine’s Day for your wedding? That is so romantic. But it also poses a challenge. Everyone will be expecting hearts, roses, and chocolates everywhere. After all, it is the Day of Love. 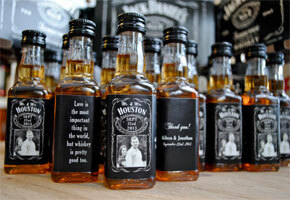 So for your wedding favors, why not play along and go with the Valentine symbol, hearts? 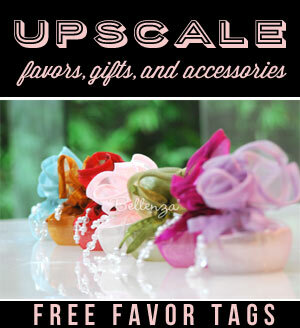 Then surprise your guests by presenting them in hip colors, an unusual material, and filled with scrumptious treats. 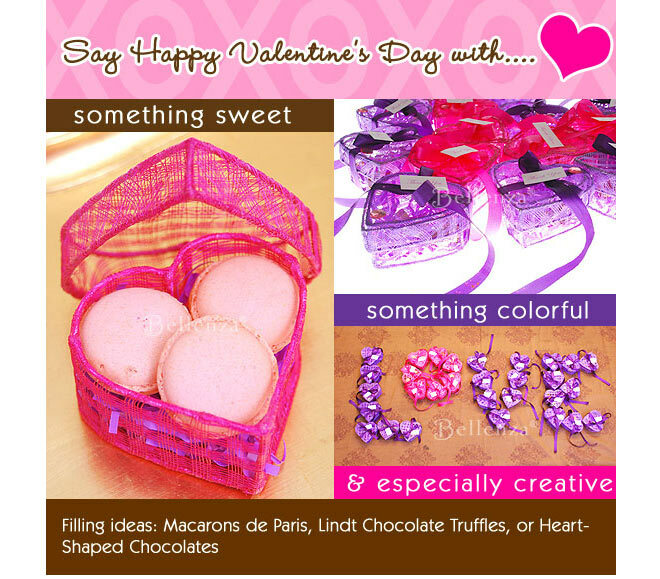 Our five-point guide below will show you how to give Valentine’s Day wedding favors! 1. Pick a Valentine-inspired container – Find containers that convey the spirit of the occasion, but are also colorful and unique. These heart-shaped boxes, for instance, are made of woven sinamay in vibrant fuchsia and purple. Their material and colors alone make an immediate style statement. Hint: Other favor packaging options could be a pretty organza circle or a dainty sachet bag. 2. Embellish with crinkle paper and ribbons – Continue the vivid effect both inside and outside the boxes. Line each one with crinkle paper in a contrasting color. This will form a bed for the yummy fillings to follow. Find matching satin ribbons in fuchsia and purple to tie the boxes securely once they’re filled. 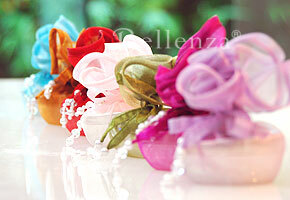 Or for a surprising visual interest using color, try mismatched ribbon colors, like soft pink and brown. 3. Bring in the sweetest fillings – Choose goodies that your guests will just love. Perhaps some Macaron de Paris for something typically French and, therefore, “romantic”? Or how about some delicious Lindt® Chocolate truffles, chocolate covered pretzels (which mimic the shape of a heart), or classic heart-shaped chocolates? If chocolates are not a preference, you can also create a medley of candies in red and pink wrappers. Use your imagination! 5. Present the favors in style – Before giving out your favors at the wedding, be sure to capture your guests’ attention with a unique favor display. Try this: use the favor boxes to spell out the word “love” on the favor table! 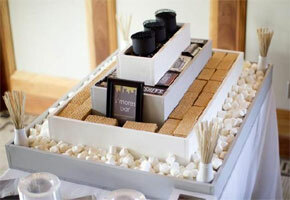 Position the boxes’ colors creatively for a truly attractive presentation. I’m totally liking this purple and fuchsia color combo! You can even put in some brown and it will look totally cool. Love your opening photo for this article! The multiple colors of the packaging really caught my eye. What fabric is it made of? It’s so pretty. It gave me the idea that favors don’t have to be wrapped identically. I’ll use this in my sister’s upcoming bridal shower. Thanks!